To like or not to like? That used to be the question. It was as simple as that. 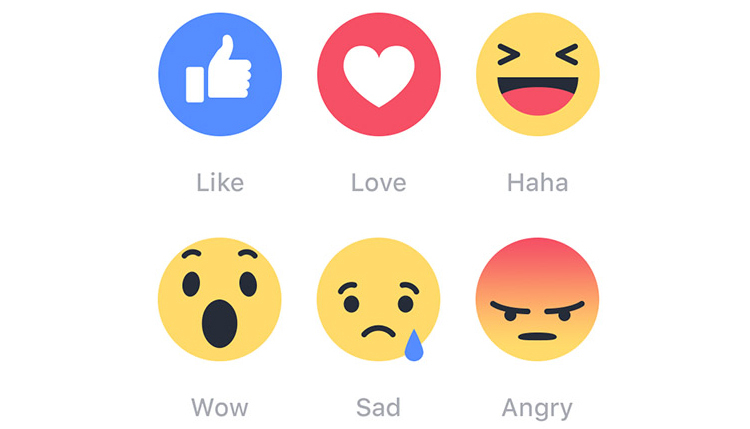 Until today, when Facebook globally launched 5 new reactions. The extension of the like button has the additional options: love, haha, wow, sad and angry, “to allow people to express a deeper range of emotions.” Our digital identities need to evolve. We’re no longer stupid like robots, but intelligent beings that actually react to the content of a post. Or not? For years, a like was the universal gesture for basically everything. It could mean a lot more than just I like this, but also I think this is funny, I agree, I understand, I care, happy birthday or even my condolences. But not anymore. Liking a sad post is no longer acceptable. Liking a happy post either. A like was never worth a lot of credit, but now that the new expressions made their entry, the like got degraded to the ‘nice try’ among reactions. Not funny, not lovable, just fine. Facebook reactions are here to make Facebook more personal. But people will comment (even) less, because they think their instant Facebook reaction says enough. Well, it doesn’t. With 120 feelings to add to our own posts, apparently we think these are a lot more interesting and important than posts of others. Haha, wow, that’s sad.